Static meshes now have a property bCanBecomeDynamic that can be set in the static mesh editor. Meshes with bCanBecomeDynamic=true will temporarily turn into KActors and react using PhysX physics when shot or pushed, giving the environment a more interactive feel. If you have existing KActors in your level, you can right click and choose convert to StaticMeshActor. Then double check that the specific StaticMesh has bCanBecomeDynamic set to TRUE. -Consistent behavior (all objects using that mesh will be interactive, instead of it depending on level designer set up). -Transparent to meshing (L.D.s don't have to do anything special, but they can prevent specific objects from being able to become dynamic by setting the bNeverBecomeDynamic property in the StaticMeshComponent's collision properties). 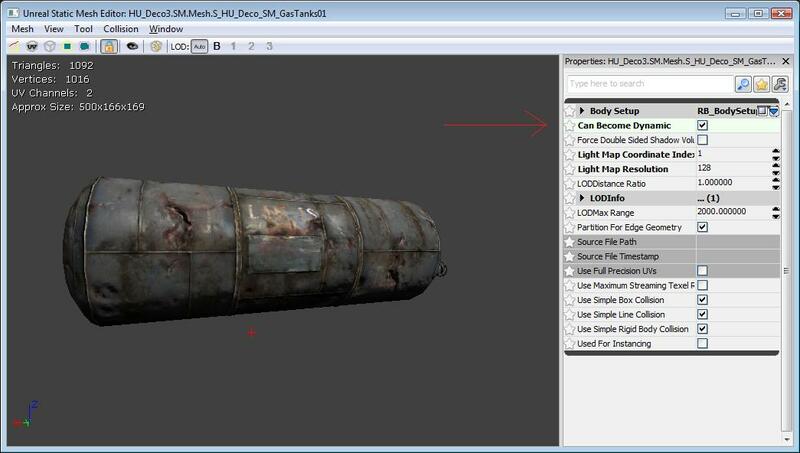 -These meshes are lit like any other static meshes until they move, so there is no visual impact to using this system. StaticMeshActors added using a mesh that can become dynamic have bSelfShadowOnly set true by default (so no shadow is left behind when they move). -Except during the short period when a mesh is being physically simulated, there's no additional performance or memory cost to these meshes. This system is intended for use with small decorative meshes that don't have any gameplay implications. The interactivity is client-side and is not replicated.